Another free snippit from Demon Rising that I’ll be publishing tomorrow. Remember, you can read my short story Into the Desert at Amazon Kindle here or another short story set in the world of Mariad, Heart’s Siege, here. Also, updates and info can be found at my website www.hywelgriffiths.co.uk. 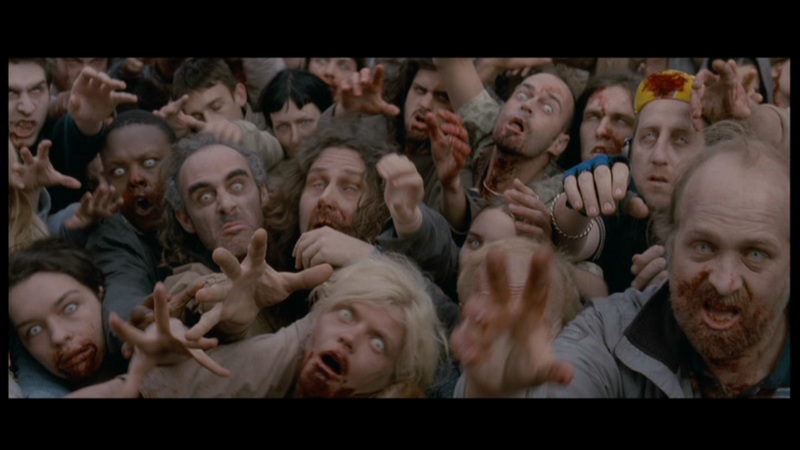 In this snippit, Heinrich and Rondur have just about escaped the living dead and are fighting their way in through a crowd of survivors to get past Abendale’s gates before they are locked out. As they make their way to the front, mounted on horses, the undead start their attack on those at the back. ‘At the back of the crowd, like hyenas pouncing on trapped animals, the reanimated corpses are feasting. They leap on backs, swipe at legs, bite into necks. The desperate travellers try to fight them off but the crazed hunger makes them unstoppable. One man strikes a rotten corpse back but a soldier with face slashed open from eye to neck gladly grabs at the exposed arm and bites in hungrily. Another person is pushed to the ground by the rioter next to him and she is quickly smothered by a pack of nightmarish creatures. They have no qualms about who they attack, no prejudice; anyone and everyone is their next target. With psychotic madness the crowd pushes the gate open and we swarm in, our horses forcing through to be ahead of the rest. Rondur does not stop and I can see why. Behind they could not shut the gates in time and the guards, few that there are, can only let the remaining survivors through in a wave. The howls and groans echo out, a stench of decay filling the air, and we know what is to come. Taking a second glance at Rondur as he dashes away, I curse at his cowardice and leap from my horse, slapping her on the rump to make her speed away. I will need her no longer. Pushing through the last stragglers that have made it in, the first of the dead comes before me and I strike out with the spear, plunging it into the yellowing head. To my amazement it collapses to the floor, and I turn to face another whose putrefied flesh has almost completely fallen from it’s bones. Bringing the shaft of my spear around in a sweep, hoping to knock it off balance, my blow clubs away the very bones that holds the thing aloft. Sweat is breaking out on me now, the effort of riding, fighting and keeping my mind steady have all driven my body hard. I know someone is at my side, and I raise my weapon to strike out, but rather than a monster I see a guard dressed in the red and yellow checkers of a strange and bizarre uniform. He holds his own against the dead that fight forward and I realise that we need to work as one to fight them back. “To me!” I cry, striking out again, but this time the corpse almost tears the spear from my hands as is turns to hit back, oblivious of the impaling. His words ring home and the images of my encounters with these things flash into my mind. As Rondur and I had rode past, I had struck out at the chilling hands and mouths that had so desperately fought to feast on me. Only some had been felled and now I realise it is those whose skulls were smashed or heads had been impaled. It is their Achilles heel. Several other guards appear, having fought his way through the mass, and we stand in a point. The people have fled, stalls abandoned and celebrations ceased, and in this deserted arena we three keep the invaders from their ceaseless march. Only that morning I had been new to the battlefield and yet now those experiences fill me with a confidence. I had fled that doomed battle and I will not flee again.